The DenTrust Toothbrush is Proudly Made in the USA. DenTrust features an advanced three-sided design that completely surrounds teeth to assure maximum coverage per brushing stroke. That makes DenTrust more efficient than a conventional toothbrush. Provides Complete Coverage with One Easy Brushing Stroke. Not only does DenTrust provide excellent coverage in less time, but more importantly, it covers hard to reach back teeth as well as inside tooth surfaces. Helps Prevent Gum Disease & Promote Better Brushing. Approximately 55% of Americans ages 18-74 have some form of gum disease. Clinical tests proved that after two weeks DenTrust was significantly more effective than a leading brand in reducing gingivitis in hard-to-reach areas. A Complete Tooth Cleaning & Gum Care System. The DenTrust Toothbrush's unique design makes it ideal for Specialty Uses. 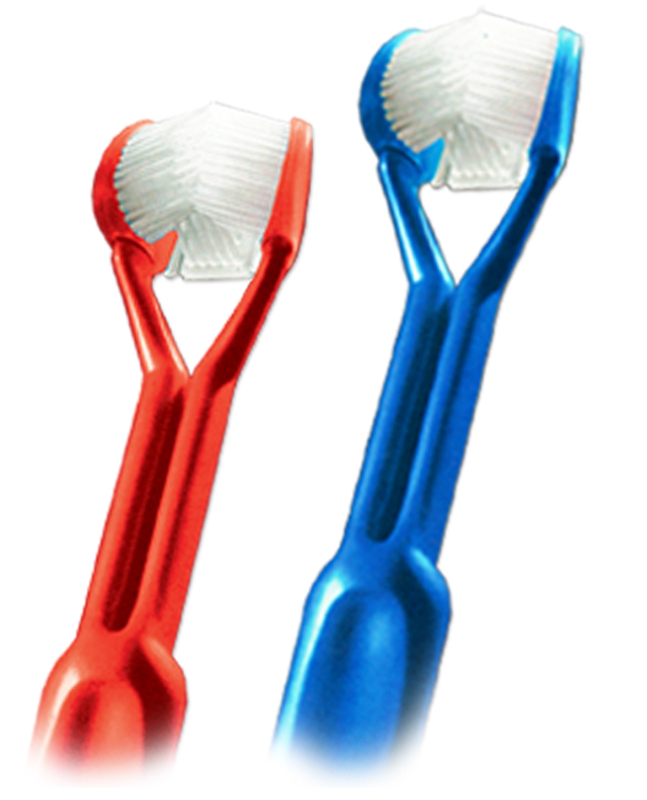 Caregivers find it ideal for assisted brushing for special needs. And its perfect for braces and periodontal disease. Introducing DenTrust – a unique, patented toothbrush designed with independent Ultralon bristles that provide cleaning and gum care advantages never before possible. DenTrust is more than a toothbrush. Three years of carefully directed development and testing now provide you with a complete tooth cleaning and gum care system. DenTrust features an advanced three-sided design that completely surrounds teeth to assure maximum coverage per brushing stroke. That makes DenTrust more efficient than a conventional toothbrush. Not only does DenTrust provide excellent coverage in less time, but more importantly, it covers hard to reach back teeth as well as inside tooth surfaces. Also, DenTrust features a patented system of expansion pleats and independent support arms to provide equal pressure to all tooth widths. 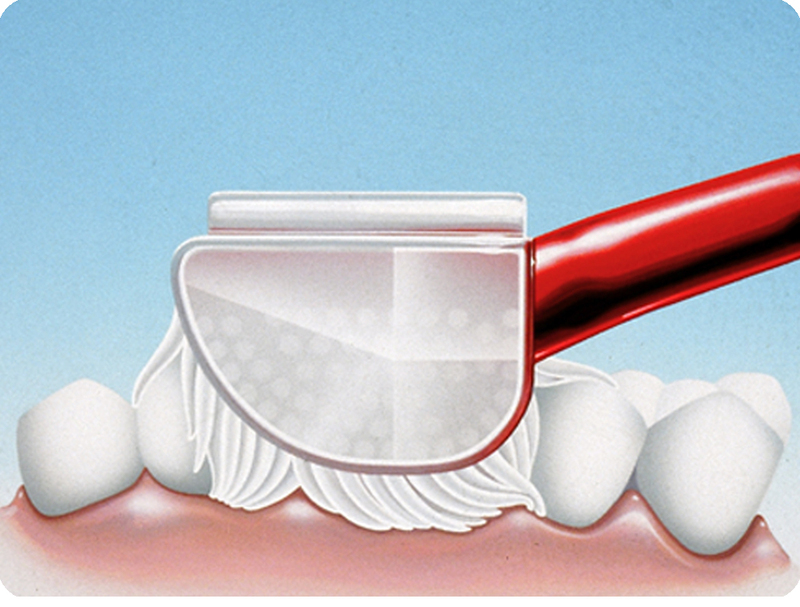 Cleaning plaque at the gumline is one of the most important elements in home dental care and often neglected. Failure to remove plaque at the gumline can lead to gingivitis, an early form of gum disease that afflicts 3 out of 4 Americans. DenTrust bristles are automatically positioned at the recommended 45-degree angle to reach-in and effectively clean the gumline. This assures a thorough and effective gumline cleaning… even in the most difficult to reach areas. Clinical studies show that conventional bristles (even the soft, end- rounded type) can contribute to receding gums and dental abrasion. DenTrust bristles are 225% softer than conventional bristles. DenTrust massages gums while cleaning the teeth to help ensure gingival health. DenTrust had consistently lower plaque scores in hard-to-reach areas. After two weeks DenTrust was significantly more effective in reducing gingivitis in hard-to-reach areas. Dental professionals recommend brushing for at least three minutes, but the average person spends only 30-60 seconds brushing. Compared to other toothbrushes, DenTrust gives you 100%-200% greater coverage per brushing stroke. 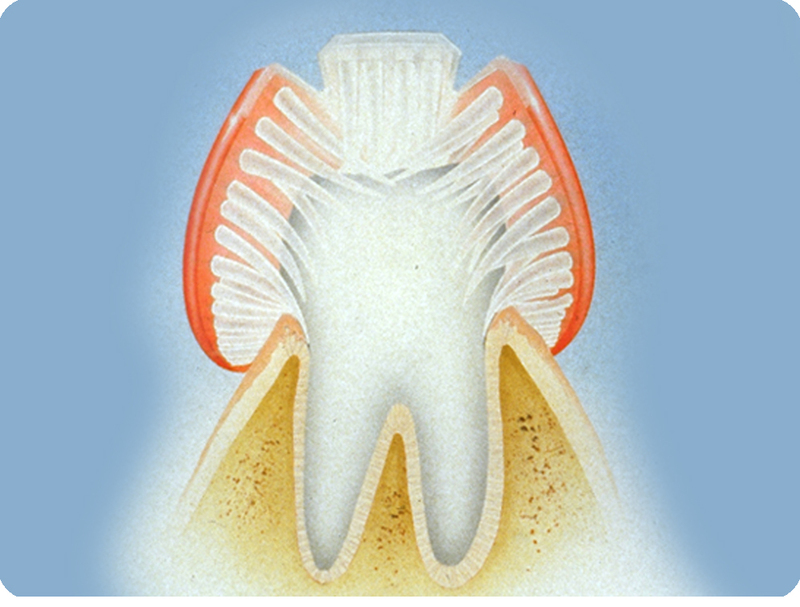 DenTrust’s unique “expansion pleats” automatically adjust the brush to varying tooth widths as you brush. Now you can be sure every tooth receives the individual attention it deserves. Plaque accumulates continuously on all tooth surfaces, especially between the teeth and under the gumline. DenTrust’s independent bristles are specifically designed to access and clean these hard-to-reach areas. Introducing DenTrust - a unique, patented toothbrush designed with independent Ultralon bristles that provide cleaning and gum care advantages never before possible. DenTrust is more than a toothbrush, it's a complete tooth cleaning and gum care system.